« Sony New Compact Camera Coming Soon? Advantages of Sony NEX-C3 over Olympus E-P3: Sony NEX C3 features 16megapixel APS-C sensor, Bigger sensor and more megapixel will give you a better dynamic range compared to E-P3, Sony NEX C3 features 5.5 fps of Continuous Shooting speed, Olympus is limited to 3fps only. Sony NEX C3 features tilting LCD whereas Olympus offers you Fixed OLED touch screen and finally about the price, Sony NEX C3 kit available only at $649, approx $250 less than Olympus E-P3. Advantages of Olympus E-P3 over Sony NEX-C3: With 35 AF points Olympus features faster AF speed compared to Sony NEX C3, Olympus also feature In-body sensor shift Image stabilization, better movie mode and OLED Touch Screen. Sony NEX c3 offers A new in-camera ‘Picture Effect’ setting lets users add extra impact to stills or HD video during shooting, without the worry of editing images afterwards. A total of 9 ‘Picture Effect’ options available in Sony NEX C3 which include Partial Color, Retro Photo, Pop Color, High Contrast Monochrome, Posterization, High-key and Toy Camera. There’s also a ‘Soft Skin’ effect that removes wrinkles and blemishes from portrait subjects. 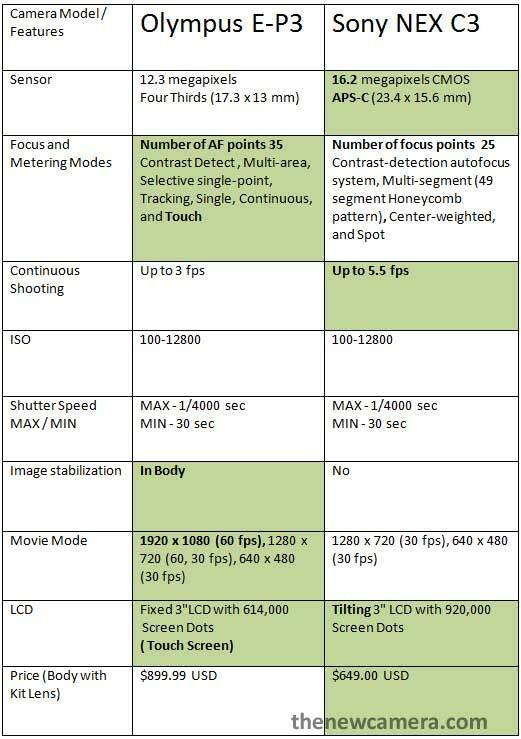 (3D) Multi-Shot Imaging Technologies in Sony NEX C3: Sony’s Advanced multi-shot technologies further broaden the possibilities of the NEX-C3 camera. 3D Sweep Panorama™ mode captures extra-wide images that can be viewed in 3D on a 3D television with compatible 3D glasses. Olympus E-P3 Art Filters : The Olympus PEN E-P3 features 10 Art Filters: Diorama, Pop Art, Soft Focus, Pale & Light Color, Light Tone, Grainy Film, Pin Hole, Cross Process, Gentle Sepia and Dramatic Tone. The camera also features nine Art Filter variations and enhancements, including new Pale & Light Color II, and five Art Filter Effects, including new Star Light and White Edge. The new Art Filter Bracketing function helps you develop multiple pictures utilizing different Art Filters with a single shot, making it possible to experiment with several different photographic effects at the same time. Photographers can use Art Filters in all shooting modes: shutter priority, aperture priority, manual and program auto modes for expanded control. All Art Filters can be applied to both still shots and Standard Definition or HD movies. Conclusion: Olympus E-P3 is overall perfect camera for still images and video shooting whereas NEX C3 is made for still shooters with a bigger sensor and better dynamic range compared to Olympus E-P3. Go for NEX C3 if you are a still shooter otherwise you have to pay $250 extra for better movie mode and FAST AF speed.